Trade mark validation at the TMCH – how to? In special cases (e.g. if you are not the owner of the mark or if the mark has been assigned to you by a court decision and not by any patent office) additional documents may be required. The electronic application form at deLink helps you there. Download the confirmation form, complete it (using 3 times the Name of the applicant – identical to the trade mark owner), sign and stamp it and scan it to a file. Set up a proof to demonstrate the active use of your trade mark. Well suited is a screenshot of your website. In the screenshot the URL, the display of the trade mark and the (company) name of the trade mark owner should be visible. A sample for a screenshot which has been used for a successful application you can find here. Photographs of products bearing the mark, catalogue pages etc. are useable as well. Log in at the Customer Administration Interface of deLink. 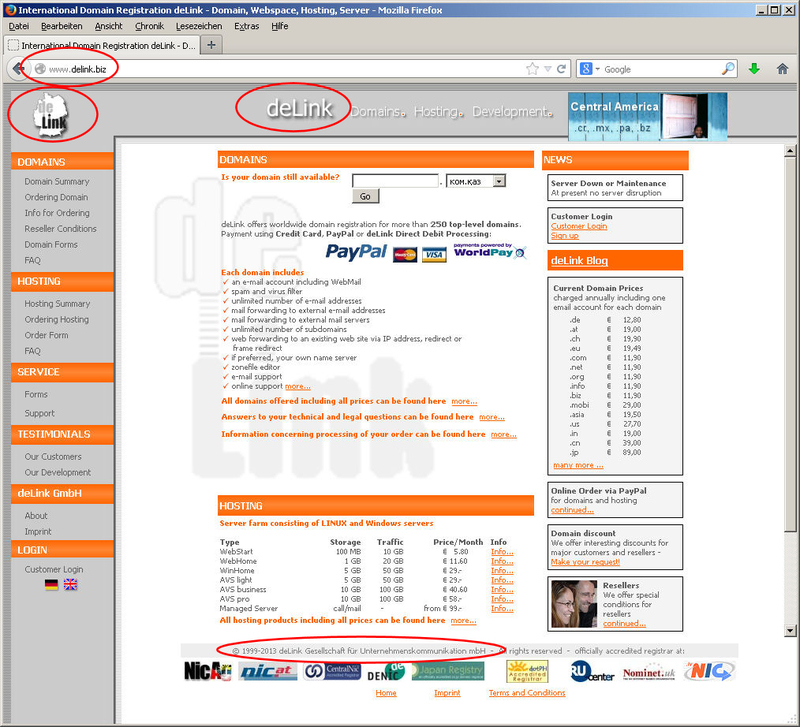 In case you are not yet a customer of deLink please set up a customer account free of cost first. The trade mark (registered at any national or international patent office like OAMI or WIPO) has to be registered and may not be expired. Usually only the trade mark data are required. You may upload the trade mark document as well – this may speed up processing in case any question do arise. Go to DOMAINS – TMCH Application. Select the trade mark from the marks uploaded before, select the duration, the status of the applicant and the invoicing contact. From the existing data a list of labels is generated. Labels are those names you may use as domain names. If your trade mark contains hyphens, spaces or special characters several labels may be generated, only one otherwise. Select whether you want to use it for Sunrise Service and/or Claim Service at each label. Usually it makes sense to select both. Finally upload the files containing the confirmation form and the proof of use. Having done this, you are finished. What happens now? deLink will check the provided data and documents for completeness and consistency. Please note: This check does not guarantee in any way that your application will be successful – but it may be helpful. If any problem is detected, we will contact you in order to solve it. Important: Please make sure that the trade mark and the owner are identical and consistent in every piece of data and documents! If your application is accepted by the TMCH you will receive the confirmation as a SMD file after about 1 week.